These great new shorts from ADIDAS feature lightweight 100% polyester knit and make for a terrific workout short. Crimson textured shorts with crimson striped inserts on both sides. 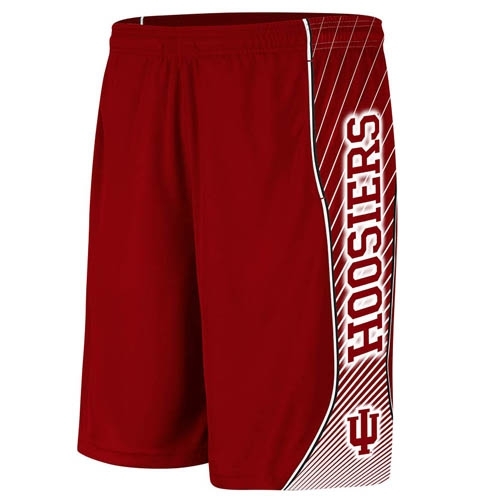 Left side has the HOOSIER IU design printed within the insert and the right is striped with Adidas logo. 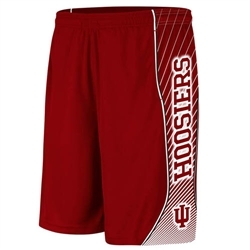 As is true of most basketball shorts, these are nice and long but have the bonus of bilateral side seam deep pockets and a drawstring. These are truly a great short at a great price. Mens (unisex) sizes and very spacious.